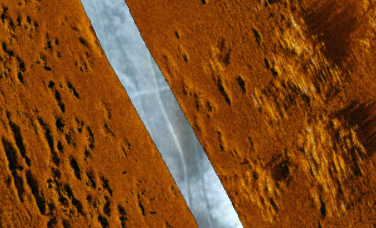 High-resolution side scan sonar can provide very detailed images of a river or lake bottom. These images can be used to classify substrate type, find spawning sites or map large aquatic vegetation. One of our most interesting side scan datasets are the images below, collected with an EdgeTech 4125 1600 kHz system, that show salmon spawning areas in the Kasilof River, here in Alaska. Click here to download the georeferenced side scan imagery in kmz format (28 MB) to see the entire mosaic in high resolution in Google Earth. If you toggle the display of the kmz file you will see that the Google Earth satellite image shows green patches of aquatic vegetation under the ice that line up with corresponding patches in the side scan image. 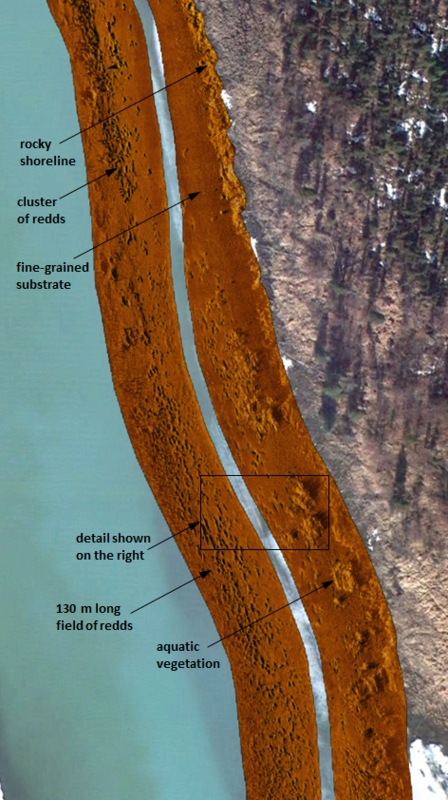 Side scan sonar imagery of salmon spawning areas in the Kasilof River, Alaska. Detail showing redds and aquatic vegetation.